In North America, about 23,000 deaths are reported every year due to superbug infections (antibiotic resistant infections). Antibiotics are given as drugs to treat bacterial infections. When the bacteria become resistant to three or more types of antibiotics, they lead to the rise of superbugs (Consumer Reports, 2015). Many factors can contribute to the cause of these antibiotic resistant superbug infections, one of which is the abuse of antibiotics in animal farm practices. Consumer Reports did a 3-year investigation on raw meat products revealing superbugs present in four major types of raw meat: turkey, chicken, beef, and shrimp. Samples taken in for testing showed superbugs present in: 84% of turkey samples, 57% of chicken samples, and 14% for both beef and shrimp samples (Consumer Reports, 2015). There may be a big gap between certain meat types, but this study was done over three years, and the sample size ranged from 168 to 304. As it is shown above, the presence of superbugs in raw products indirectly proves the overuse of antibiotics in animal farm, which leads to the death of superbug infected patients. On the other hand, according to the Consumer Reports, the meat and poultry industries claim that drugs (antibiotics) were not widely overused and the use of drugs are important to ensure animal’s health, welfare and food safety to a certain extent. However, the science behind it suggests otherwise. How does antibiotic resistant occur? 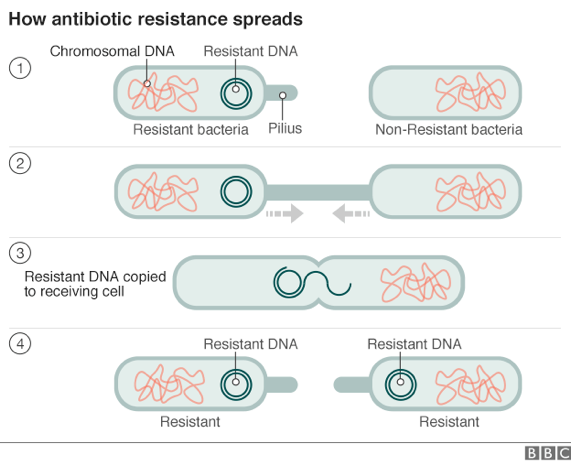 DNA mutations often occur naturally in bacteria, but when a gene that is responsible for the bacterium’s survival is mutated, antibiotic resistance may appear. Antibiotic resistance happens when a pathogen manages to escape from being killed by antibiotics and therefore, is able replicate in numbers. However, it does not need a daily routine of antibiotic applications to encourage superbugs to flourish as there is also another mechanism in promoting the multiplication. Gene transfer is a common mechanism that happens as a DNA of an organism is passed onto another organism that is nearby; consequently, infecting neighboring organisms. Will it cause extreme harm? No, as long as you cook the meat to the appropriate temperature, harmful pathogens should not be able to survive and infect us. However, if we do get superbug infections from eating meat that were not cooked properly, it would become a life-threatening situation since superbugs are resistant to all known antibiotics. If there are people who are very concerned with superbugs in the meat, switching to meat products that are labeled “Organic” or “No Antibiotics” will minimize the chances of superbug exposures. I was not surprised to learn that the use of antibiotics in animal farming contributes to the prevalence of antibiotic resistance. To avoid contracting infections cause by such pathogens I always choose to buy meat from organically raised animals. However, I did a quick research in the present literature and surprisingly came across several articles that report the presence of antibiotic resistant pathogens in organic meat, with levels similar to those of conventionally raised animals (LeJeune & Christie 2004; Luangtongkum et al. 2006; Millman et al. 2013). This could be due to cross-contamination post-slaughter or due to the fact that “organic chicks can receive antibiotics via in ovo injections and during the first day of life” (Millman et al. 2013)!! LeJeune, J. T., & Christie, N. P. (2004). Microbiological Quality of Ground Beef from Conventionally-Reared Cattle and”Raised without Antibiotics”Label Claims. Journal of Food Protection®, 67(7), 1433-1437. Luangtongkum, T., Morishita, T. Y., Ison, A. J., Huang, S., McDermott, P. F., & Zhang, Q. (2006). Effect of conventional and organic production practices on the prevalence and antimicrobial resistance of Campylobacter spp. in poultry. Applied and environmental microbiology, 72(5), 3600-3607. Millman, J. M., Waits, K., Grande, H., Marks, A. R., Marks, J. C., Price, L. B., & Hungate, B. A. (2013). Prevalence of antibiotic-resistant E. coli in retail chicken: comparing conventional, organic, kosher, and raised without antibiotics. F1000Research, 2. Hello! I have actually read an article on New York Times that a lot of newborns in India have been dying as a result of superbugs infections. This is largely due to an uncontrolled usage of antibiotics that lead to the massive growth of multi-drug resistance bacteria. The lack of sanitation and hygiene forced health agencies to look into increased use of antibiotics. As we have learned in class, babies/young children are the most susceptible to diseases because they have not yet acquired a strong immune systems or micro-flora that helps them combat other pathogenic bacteria. It is even more frightening to note that the routes of transmission… are everywhere! This includes the water, sewage, animals, soil and even humans may b e carriers of these superbugs. I guess since antibiotic residue testing is not part of regulations in India, or is not highly regulated, that this is able to happen. It’s dangerous to have antibiotic residue because the effects of the metabolism/degradation of these residues in human bodies is also unknown. As we’ve learned in class, it could lead to health issues as well as the development of antimicrobial-resistant strains of microorganisms. Why do they suggest that cooking will help? Is it because cooking will denature these antibiotic compounds? What if they become carcinogenic or mutagenic from heating? Sorry India is in response to Shinnie’s post. And I mean that the antibiotic residue testing may not be part of the routine testing in North America. Wow! Thanks Shinnie and Susanna for the discussion! In my opinion sanitary and hygiene controls are especially important for us as consumers when handling food. Public education on prevention of superbugs may be helpful in reducing the infected population; in fact, knowing about this may assist mothers to become more aware of the disease. Additionally, how animals are raised and in what environment they are raised in may also contribute to the safety of our daily diets. I had a couple of questions in mind after reading the article: I wonder why turkey would be on the top of the list? How does shrimp acquire the superbugs? Can fish be potentially contaminated as well? As a vegetarian, I am once again appalled by this. I find this especially concerning as such meat products could potentially harness growth of stronger and potentially much more dangerous pathogens in the farm environment. It seems like as of now, the only regulations in North America for drug resistance genes are visual quality checks that only scrape the surface, and there is room for more research in this area.